An essential requirement of road markings is that they are highly durable. However, this can present a problem when the time comes to remove them. There are various reasons for road marking removal, from general and natural wear and tear to changes in the layout of roads or even incorrect layout in the original instance. Whatever the reason for removal it is a demanding task as thermoplastic paint is used to apply road markings and cannot be washed away. 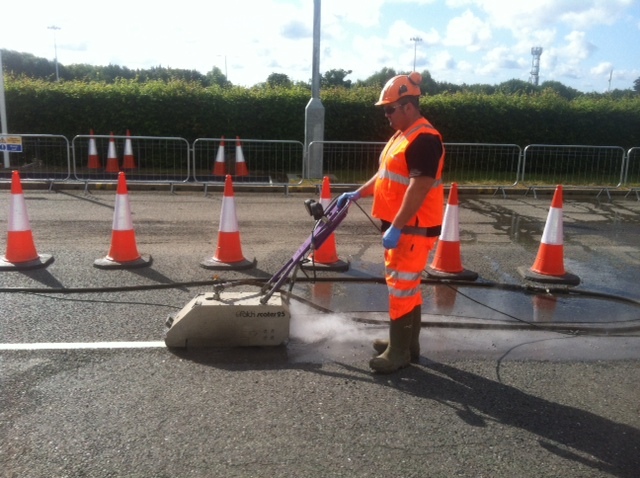 Hydroblast are a professional cleaning company and we offer road marking removal along with a complete range of essential high pressure, water jetting services. We provide the efficient services of white line removal, yellow line removal and even the challenging removal of anti skid. Whatever your need Hydroblast can safely and successfully eliminate any road markings. At Hydroblast we use the Falch water jetting machine and we offer nationwide delivery of both the machinery and the spare parts. We also supply leasing, hire purchase, long term rental and spot hire and we use qualified staff that will carefully train you in the use of the machinery. Because we know how important it is to test drive any machinery we offer a demonstration so you can see our effective and easy to use machines in action for yourself and make an informed decision on which is the best option for you. We also supply second hand Falch machines which we aptly refer to as ‘Perfect Seconds’. We guarantee that the only difference between a used water jetting machine and a new one is the hours on the clock. We will guarantee all the used machines for a full six months. Removing paint from walls, floors, vehicles and machinery can be a challenge as it is not always circumstantially appropriate to employ the use of chemicals and solvents, plus these materials can be hazardous so Hydroblast provide a full paint removal service which simply involves the use of our Falch water jetting machines and the expertise of our highly trained staff. We can provide industrial cleaning for your floors and strip machines of old layers of protective paint. Whatever professional water jetting services you require, from outdoor cleaning to road marking removal Hydroblast can provide the powerful and high pressure jetting services to remove all your unwanted paint and unsightly substances. Visit us at hydroblast.co.uk for information.